Two things happen when I read Anne Lamott’s nonfiction. First, I begin to think I am as funny as she is. Secondly, I cry. Never fails on either count. In regards the first outcome, last night, just after I finished Some Assembly Required on the flight back from Alabama, I realized I had left my reading light on. Given that I was, um, no longer reading, the light was casting a golden, glow on the cleavage I had not intended to show anyone, let alone everyone in two states. I pulled up my tank top and made a mental note: a wrap dress is not a good call in airport fashion. As I reached up to shut off the light, I began to imagine myself in one of those Glee-like moments where the cabin goes completely dark, and I’m there with just a spotlight on me (or more specifically, my cleavage). Except then, I had no pithy song and dance number . . . instead, everyone in the cabin was forced to hear me read rough drafts of my book . . . I totally got myself giggling at my own humor. . .
until I realized I’m not as funny as Anne Lamott. . . . then I just turned out the light and tried to nap through our descent. This seemed wise. In terms of the second count, the tears came in this book as I realized how very much my mother was influenced by Lamott’s writing and outlook on life. My mom and I both love Lamott, and we would swap our favorite scenes from her books. I personally love her conversion story that consists of a ghost cat and the extra phrase, “F*^% It!” For Mom, it was the God Box, the little box where Lamott drops the names of things and people that are worrying her so that God can carry them. Clearly, my mom was more holy than I am. Mom created herself a God box, and then, she created one for all the women she knew. They still tell me about how they use theirs. . . it’s a beautiful testament to my mom. So there on the plane (before the cleavage illumination) I started to cry, just remembering how wonderful a woman my mom was . 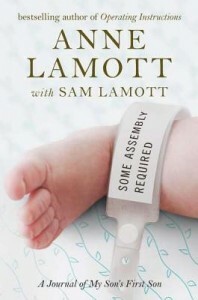 . . and thanking Lamott for making her just a little more wonderful. If you haven’t read Lamott, START NOW . . . if you have, then definitely pick up this new book. It’s her at her most honest, neurotic and gorgeous. Plus, so so funny . . . no wonder I want to be like her. . . no wonder my mom did.